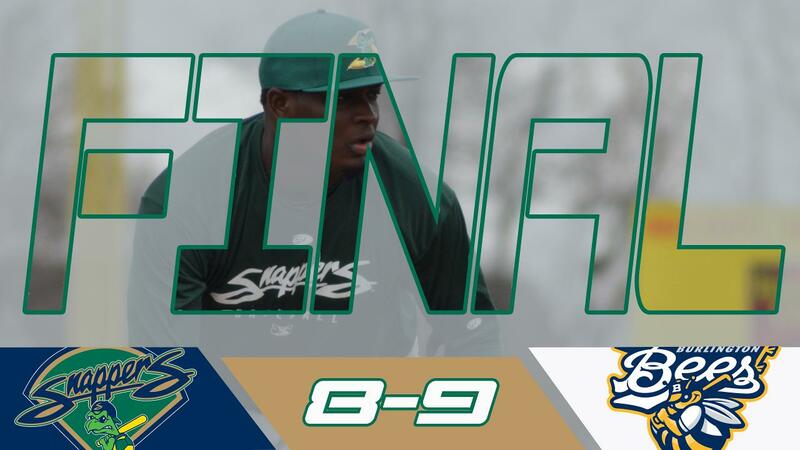 BURLINGTON, IA - The Snappers came up on the short end of the scoreboard tonight falling to the Burlington Bees 9-8 in ten innings. The Snappers started the game off strong once again, putting up four runs in the first inning and jumped out to an early 4-0 lead. Chase Calabuig started the hitting for the Snappers singling up the middle in the first. Cobie Vance would then reach on a walk before John Jones picked up his first hit of the season singling up the middle. Then the Snappers struck for some runs. Nick Ward would hit a sacrifice fly to left field that knocked in Calabuig for the first run of the game. Then, just one batter later, Nick Osborne would step up to the plate and unload on a ball clearing the bases and extending the Snappers lead to 4 to begin the game. However, Osborne's homer would not be the only longball hit tonight. Shortly after in the bottom half of the first, Bees right fielder, Spencer Griffin, deposited a ball over the right field wall to get the scoring started for Burlington. Burlington would get another run in the second inning before the long ball would be on display once again, this time from another Snapper. In the third inning, John Jones, the cleanup hitter, would do just that, as he cleaned up the bases after crushing his first home run of the season over the right-center field wall. The homer was of the two-run variety with Jones knocking in Vance who earned his second walk of the game earlier. Jones' homer put the Snappers out 6-2 at the time, but that lead was not safe. In the sixth inning, Burlington would put up a 3-spot after a solo shot from D.C. Arendas and a couple of timely, situational at-bats. But Burlington was not done, as they got one run in the eighth to even the score at six a piece heading to the ninth. Both teams failed to score in the ninth, but it was not would not come easy on the mound. Burlington would get the first guy on, but Snappers reliever Charlie Cerny held strong to get around the leadoff walk and send the game into extras. In the Snappers first extra-innings affair of the year, the Snappers would strike at the first chance they got. With Payton Squier starting on second base due to extra inning rules, Ryan Gridley would lay down a perfect sacrifice bunt to move Squier over to third. Logan Farrar would earn a walk and one batter later, Lester Madden continued his scorching hot start driving a double to center field that knocked in Squier to give the Snappers the 7-6 lead. The Snappers were not done yet, as they tacked on an insurance run thanks to the bat of Cobie Vance. With the bases loaded, Vance drove a ball to centerfield driving in Farrar and pushing the Snappers lead to 8-6. The Snappers would then turn to Brandon Withers, already with one save on the young season, to try and shut the door in the tenth. Although, the Bees would still get their crack at it and responded in a big way. After working the bases loaded with just one out, Connor Fitzsimmons would get hit by a pitch to bring in a run resulting in just a one-run lead for Beloit. Next, with the bases still loaded, Michael Stefanic would single home a run to even the game at eight. Then, one batter later, Jordyn Adams would single to right field knocking in the winning run and giving the Bees the walk-off victory. The Snappers will look to bounce back against Burlington again tomorrow in game two of a four-game set before returning home on Friday for a 3-game set against the Clinton Lumberkings.